If you’re planning to visit the Disneyland Resort this summer and enjoy the new, action-packed attraction, Guardians of the Galaxy — Mission: Breakout! 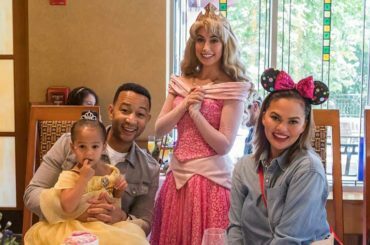 inside Disney California Adventure, you might want to consider staying at one of the Disneyland Resort’s three on-property hotels for the ultimate vacation experience, totally enveloped in the magic. Whether you’re interested in the original Disneyland Hotel, upgraded with the latest modern facilities but infused with nostalgia, or Disney’s Paradise Pier hotel with its view over the iconic Paradise Pier section of the park, or or the arts & crafts style Disney’s Grand California Hotel & Spa you’ll find a a price point to fit your family’s needs. As we’ve reported the Grand Californian is currently in the middle of a hotel-wide renovation which includes new rooms and upgrades to the public areas. The most extensive refurbishment since the hotel’s opening in 2001. 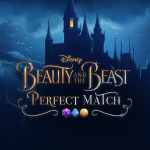 For a limited time, a special hotel offer is available for guests looking to stay in the middle of the magic. Guests may save up to 20 percent on premium rooms for select nights at Disney’s Grand Californian or the Disneyland Hotel, for travel from now through June 15, 2017, if booked by June 15. Call your authorized Disney travel agent for booking assistance (see below for The Disney Blog’s in house agent details). Goofy’s Kitchen at the Disneyland Hotel buzzes with character encounters throughout the day, including the new Disney Dinnertime Magic with Chef Mickey. Also at the Disneyland Hotel, the vintage Hollywood-inspired Steakhouse 55 recently developed a new menu filled with indulgent breakfast items—and creative cocktails. In the afternoons, guests will experience Classic Afternoon Tea at Steakhouse 55. The mid-day tea service offers sweets, savories and an exquisite selection of specialty teas. 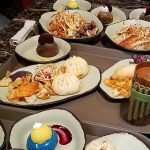 At Disney’s Grand Californian’s signature restaurant, Napa Rose, Disney’s expert staff of sommeliers have curated a special menu during the new Napa Rose Food and Wine Pairing Experience. Offered on weekend afternoons, guests will indulge in hand-selected wine tastings in the lounge. For delicious dinners in a casual setting, guests will enjoy meals at Disney’s PCH Grill at Disney’s Paradise Pier Hotel and Storytellers Café at Disney’s Grand Californian. Fine dining is available at the award-winning Napa Rose at Disney’s Grand Californian and at Steakhouse 55 in the Disneyland Hotel. Guests will enjoy sunny summer days at any of the distinct pools found at the on-property hotels. The Disneyland Hotel pool and water play area feature waterslides reminiscent of the original Mark I Monorail trains from Disneyland Park in the early ‘60s. The boardwalk-inspired, rooftop pool at Disney’s Paradise Pier Hotel features a 186-foot slide resembling a classic, beachside roller coaster. At Disney’s Grand Californian, the recently refreshed pool deck includes new hardscape reinforcing the resort’s Craftsman design. A variety of natural stones were chosen to create a warm and welcoming environment at each pool. The 90-foot-long Redwood Creek waterslide curves around a giant Redwood tree stump, inviting guests to come and splash into the Redwood Pool. The pools at each of the hotels come to life during energetic afternoon pool parties. These parties throughout the summer include games, music, dancing and more. Guests who enjoy lounging by the pool may consider reserving a private, poolside cabana, available at the Disneyland Hotel and Disney’s Grand Californian for a half-day or full-day rental. Guests will stretch out under a shaded cabana equipped with everything they need to relax. On select summer nights, guests also will enjoy movie screenings at all three hotels. During Magical Night at the Movies, guests are encouraged to kick back on beach chairs and towels to watch a Disney movie under the stars. Guests with concierge-level reservations may take advantage of evening desserts and after- dinner beverages in the three hotels’ concierge lounges. For guests staying at the Disneyland Hotel, the E-Ticket Club is ideal for viewing the nighttime fireworks spectacular with a corresponding soundtrack piped in throughout the lounge. 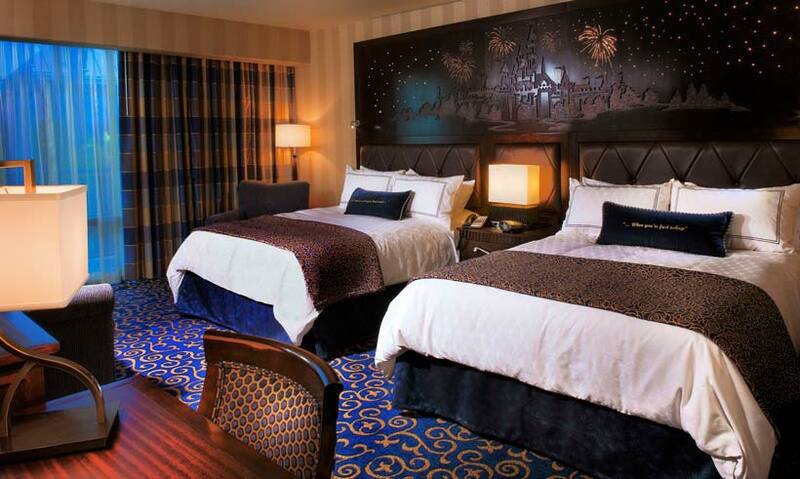 Guests also enjoy many extras when they stay at the Hotels of the Disneyland Resort. Registered Disneyland Resort hotel guests with admission tickets may take advantage of Extra Magic Hour, which allows them access to select theme park attractions, stores, entertainment and dining locations for one full hour before the parks open to the general public (available on select mornings; theme park admission and valid hotel key card required**). 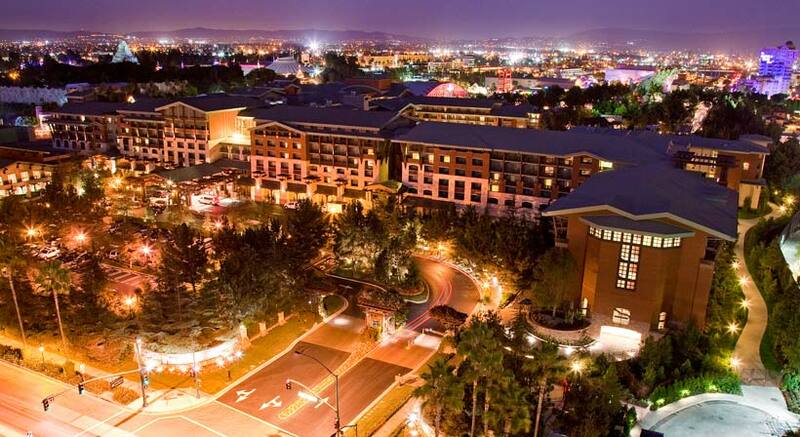 In addition to being steps away from Disneyland and Disney California Adventure parks, the hotels are a short walk from the eclectic mix of dining, shopping and entertainment features of the Downtown Disney District.